As usual, Wondry does a fabulous job teaching history. Very entertaining and well made! excellent podcast. very well done. J. Edgar Hoover became director of the FBI when he was just 29 years old. His orders? Clean up the Bureau. At first, he proved to be a brilliant and innovative leader, setting new standards for education, physical fitness, and training of federal agents. But there was a dark side to his success. Hoover was also obsessed with tracking anyone he considered to be disloyal to the U.S. government. By the early 1930s, the Bureau was secretly compiling dossiers on tens of thousands of American citizens, in defiance of government orders. And Hoover understood that the best cover for his actions lay in bolstering the Bureau’s reputation as a beloved and virtuous American institution. All he needed was the help of an expert in an emerging but promising field: public relations. By the turn of the century, radical anarchists were becoming a growing -- and volatile -- political movement. As shifting workplace conditions exploited and endangered American workers, anarchists increasingly turned to violence to spur everyday citizens to upend the capitalist system. The growth of these politically motivated shootings and bombings stoked fear among American citizens — fear of immigrants, outsiders, and anyone else whose ideas might be considered a threat. Soon President Woodrow Wilson was calling on his attorney general A. Mitchell Palmer to investigate, arrest and imprison any noncitizen suspected of spouting “disloyal” or “radical” ideologies. The so-called Palmer Raids would move the little-known, poorly funded and notoriously corrupt Bureau of Investigation into the national spotlight. And it would eventually launch the career of an ambitious young civil servant named Edgar Hoover. “Mine eyes have seen the glory of the coming of the lord.” That’s the opening line of “The Battle Hymn of the Republic” written by Julie Ward Howe in 1861. Over the years, it’s become something of an unofficial national anthem for all manner of political causes in the United States. Historian Richard Gamble joins us to talk about the song, its meaning, and its history in everything from The Civil War to The Civil Rights Movement. Read more: A Fiery Gospel: The Battle Hymn of the Republic and the Road to Righteous War. The Art of Shaving - Get 15% off your first order by using the code "Tellers" at checkout, online or in the store. As legal challenges to his New Deal programs mounted, President Roosevelt and his attorney general devised dramatic reforms to the Supreme Court’s structure. The proposed changes would open new rifts between the president and conservative members of his own party. Other greater challenges loomed. A recession was threatening to unwind four years of economic recovery. The Senate launched a politicized investigation into purported un-American activities in federal work programs. And on the other side of the world, a global crisis was building as war erupted in Asia and Europe. As the country re-armed and factories retooled to supply soon-to-be allies, the nationally finally pulled itself from the depths of Depression. Legacy Box - Go to LegacyBox.com/TELLERS to get 40% off your first order today! This year marks the 75th anniversary of D-Day, the longest day in military history. For the first time, you can hear perspectives on the conflict from all sides on the podcast Unknown History. Bestselling historian Giles Milton shares stories from pilots, sailors, soldiers and bystanders. Subscribe at bit.ly/ddaypod. With the country was still hobbled by the Depression, New York Governor Franklin Delano Roosevelt promised a “New Deal” for the American people. That vow handed Roosevelt a contested Democratic nomination and helped him crush Hoover in the general election. Roosevelt began his presidency with a flurry of policy proposals and legislative efforts focused around three priorities: relief, recovery, and reform. These new efforts saw millions of young men put back to work preserving natural areas as part of the Civilian Conservation Corps and undertaking a massive rural electrification project in the Tennessee River Valley. And the country’s first female cabinet member led the creation of Social Security, one of the crowning achievements of Roosevelt’s administration. Meanwhile, a reckoning was in order for Wall Street. Years after the stock market crash, a raucous senate investigation would unveil egregious abuses by financiers. Factories have shut down, banks have failed, and millions are out of work. As the Depression worsens, public opinion sours toward President Hoover. Hoover’s allies attempt to counter criticism of the President by galvanizing anti-foreigner attitudes. They devise a scheme to frighten immigrants from Mexico and other countries with the specter of mass immigration raids in the hopes they’ll leave the country on their own, as hundreds of thousands do. Meanwhile, an unemployed cannery worker from Portland, Oregon leads tens of thousands of World War I veterans on a march to Washington, D.C., to demand payment of wartime bonuses. A deadly showdown looms as this “Bonus Army” wears out its welcome in the capital. You can find new episodes of American History Tellers, completely ad-free, only on Stitcher Premium. For a free month of Stitcher Premium, go to stitcherpremium.com/wondery and use promo code ‘WONDERY’. Legacy Box - Go to legacybox.com/tellers to get 40% off your first order! The Roaring Twenties came to a screeching halt on October 29, 1929, with the collapse of the U.S. stock market. A year earlier, president Herbert Hoover had coasted to victory by promising the American people “a chicken for every pot” and “a car in every backyard.” Lured by the promise of skyrocketing markets, many first-time investors got caught up in margin trading, borrowing money to make bigger stock purchases than they could actually afford. It was a foolproof way to make money, so long as stock prices kept rising. But then, on the morning of Tuesday, October 29, more than sixteen million shares changed hands on the floor of the New York Stock Exchange. By the market’s close, investors had lost tens of billions of dollars — and kicked off a decade that would reshape American institutions, even as labor unrest, racial tensions, and the dark shadow of nativism pushed back from all sides. "Those who do not remember history are condemned to repeat it." On today’s show, we’ll consider what lessons we can draw from history, and what lessons we can’t. David Greenberg, a professor of history and media studies at Rutgers University, joins us to discuss how to connect the events of the past to the events of today. We’ll also talk about his latest book “Republic of Spin: An Inside History of the American Presidency,” which explores the history of political messaging inside the White House. Plus, Jesse James and this day in history. Sleep Number - Visit SleepNumber.com/TELLERS to find a store near you. A special series with Legal Wars. The whole world was watching, and that’s exactly what the defendants wanted. As the end of 1969 approached, the Chicago 8 had become the Chicago 7. Bobby Seale, a Black Panther, had been removed from the trial in a brutal spectacle by Judge Julius Hoffman. The remaining defendants would respond by turning the courtroom upside down, much to the delight of the national media. Counterculture celebrities Allen Ginsberg and Norman Mailer would take the stand. And in the end, it was the establishment that would be put on trial. We live in historic times, but how do they compare to that other tumultuous era of American history — 1865 and the years following President Lincoln’s death and the end of The Civil War? Steven Walters, writer of Lindsay Graham’s new scripted podcast “1865,” joins to discuss the thrilling story of how our country put itself back together again and brought Lincoln’s killers to justice. Plus, a preview of what’s to come on “American History Tellers” in 2019. You can listen to new weekly episodes of “1865” exclusively on Stitcher Premium. For a free month of Stitcher Premium, go to stitcherpremium.com/1865 and use promo code ‘1865’. The year 1968 marked a watershed in American politics. Anti-war protests were roiling the country. Civil rights leader Martin Luther King Jr. was shot dead in Memphis. Democratic President Lyndon Johnson’s approval rating was plummeting. The assassination of Democratic presidential hopeful Robert Kennedy would throw the party into disarray, toppling the New Deal coalition built by Franklin Delano Roosevelt two generations earlier and leading to a conservative surge. The political sea change would drive Republican nominee Richard Nixon to the White House in 1968. And it would eventually elect a former actor and California governor who would change the face of American politics in ways that are still being felt to this day. His name was Ronald Reagan. The 1929 stock market crash saw 14 billion dollars vanish in a matter of hours — and with it, the Republican party’s decades-long grip on American politics. As Americans lost their livelihoods, they turned to President Herbert Hoover for relief. But the self-made man who had so successfully reversed his own fortunes seemed unable to do the same for his country. With discontent growing, Hoover turned on World War veterans demanding early bonus payouts to support their families. It would prove the last straw for many Americans. The landslide election of 1932 would mark a profound realignment in U.S. politics, bringing urban centers under Democratic control for the first time in the party’s history. And it would propel into the White House Franklin Delano Roosevelt, whose sweeping New Deal would permanently transform the American political landscape. The Art of Shaving- Get 15% off your first order by using the code "Tellers" at checkout, online or in the store. As the Civil War came to a close, the government set its sights once again on the future of the United States. Working closely with a Republican President, the Republican Congress expected a swift and peaceful road to Reconstruction. But then, a mere four weeks into his second term, Lincoln was assassinated, leaving the country in the hands of Andrew Johnson, a Southern Democrat who had personally owned slaves just three years before. While Johnson’s unwavering commitment to states rights cultivated a fraught relationship with his Congress, the tumult would ultimately be short-lived. After just four years of a Democratic president, America’s Grand Old Party would ascend to power—and hold it—for over 70 years. Article - Visit Article.com/Tellers to get $50 off your first order of $100 or more. Subscribe to Mythology wherever you listen to American History Tellers. The United States won the The Mexican–American War in the 1840s, and with it vast new stretches of western land. But in the 1850s, the question of what to do with this land – and whether to allow slavery in the new territories or not – became a redning issue for politicians of all stripes. While the Whig Party collapsed over the issue, Democrats split into Northern and Southern factions, and a new Republican Party tried to bind the Union with an appeal to old Jeffersonian values. But in the houses of Congress and across the nation, negotiations fail, compromise is abandoned; and the issue of slavery will overshadow all else, leading to Civil War. Heavily researched, this historical political thriller is an audio drama that explores America’s darkest hours. The story is astonishing—and all of it is based on true events. You can listen to new weekly episodes of 1865 exclusively on Stitcher Premium. For a free month of Stitcher Premium, go to stitcherpremium.com/1865 and use promo code '1865'. Named after one of the greatest U.S. presidents, the Lincoln Motor Company has become as ingrained in American culture as the Statue of Liberty. Founded by Henry Leland to produce plane engines during World War I, Lincoln became a key driver of the early automobile industry in the United States and a pioneer of the luxury car market. But when Leland’s vision proved too ambitious for the nascent American car market, Lincoln was purchased by the Ford Motor Company. The Ford acquisition would prove to be a game-changer for Lincoln. It provided the young company with a jolt of capital, marketing know-how, and a secret weapon: Henry Ford’s son, Edsel Ford, who possessed an uncanny sense of style and what customers wanted. He would lead the Lincoln to build an entirely new class of automobile: something “strictly continental.” Brought to you by the 2019 Lincoln MKC. Andrew Jackson lost the 1824 presidential election to John Quincy Adams through what some called a “corrupt bargain” in the House of Representatives. The maneuver was masterminded by hot-headed but politically savvy Henry Clay, who with Adams, announced their intent for far-reaching new federal programs. Fierce opposition to these policies united pro-Jackson supporters who formed a new party, the Democrats, to rally around their hero and elect him to president in 1828. But while Adams was defeated, Henry Clay had no intention of leaving the fight. He helped lead a new party which gathered together anti-Jackson, fiscal conservatives, and pro-states rights factions. The rise of Clay’s new Whig party seemed unstoppable–they captured both houses of Congress and the presidency–until, on April 4, 1841, president William Henry Harrison died in office and gave John Tyler the power of the veto. But immediately after Washington vacated the Presidency, factions did spring up and bitter personal rivalries began to shape the nation. The two first political parties–the Federalists and the Republicans–had very different views of what America should become, and were led by very different men: Alexander Hamilton and Thomas Jefferson. Quip - If you go to GetQuip.com/Tellers you'll get your first refill pack free with your order of a Quip toothbrush. We conclude our series on the American Civil Right Movement with an interview with a woman who was there, on the front lines of the fight. Peggy Trotter Dammond Preacely is longtime civil rights activist and artist. She was a Freedom Rider, boarding busses to travel the south in a fight for desegregation, and member of the Student Nonviolent Coordinating Committee, participating in sit-ins, marches, and voter registration campaigns. She marched on Washington, was arrested three times, was visited in jail by Martin Luther King Jr., and leads a life defined by her heritage, commitment to nonviolent activism, and the hope for continued change. You can read Peggy's poem here. ZipRecruiter - Visit ZipRecruiter.com/AHT for a free trial and see for yourself why ZipRecruiter is the smartest way to hire. Seeking to build upon the gains of the early 1960s, Civil Rights activists pushed forward on a series of ambitious efforts. Voting rights activists returned to Alabama and again faced violent reprisal—this time televised for the country to witness. A shocked nation watched the violence in Selma in horror; Congress took action, passing the Voting Rights Act. Off of this success, Martin Luther King Jr. began building a coalition of activist groups to turn the nation’s attention to the fight against poverty. Gathering support for a massive march on Washington, Dr. King visited Memphis, hopeful and in high spirits. He did not leave alive. The Great Courses - TheGreatCoursesPlus.com/TELLERS has everything you could ever want to learn. Try it free! As the Civil Rights movement entered the landmark years of 1963 and 1964, activists had faced many challenges - but had also won many victories. Now, they sought to launch new campaigns in Alabama and Mississippi and mass demonstrations in Washington D.C. and New York City. In the span of sixteen remarkable months, the movement and the nation itself would be transformed, walking the razor’s edge between triumph and tragedy. ZipRecruiter - ZipRecruiter.com/AHT is the smartest way to hire. As the Civil Rights movement entered the Sixties, a new generation of activists took the fore. Frustrated by the pace of progress but emboldened by strides made in the previous decade, students embraced “nonviolent direct action,” protest techniques that were provocative but peaceful. Soon, a wave of sit-ins hit lunch counters across the South. The response was caustic, often violent; but the protesters’ persistence led to negotiations with business owners and civil authorities that led to successful desegregation. The next wave of direct action - the Freedom Rides - met much worse and more violent resistance. Protesters were beaten, busses burned, and hope was nearly lost. Then, when activists moved into the rural South to organize the black vote, white supremacists’ ire turned murderous. After the Brown V. Board of Education ruling, civil rights activists had legal standing to desegregate schools. But doing so proved dangerous. The first black students to step into newly integrated schools faced extreme hostility from whites who felt Jim Crow society was under attack. The segregationists defied federal court orders. When National Guard troops sent by President Eisenhower forced the issue, white supremacists changed tactics, patiently and cruely wielding political and economic influence against activists. And when even those measures proved not enough to stop integration, some communities abandoned public education altogether, for whites and blacks. Closing all schools, they felt, was better than integrating them. Ancestry - Visit Ancestry.com/Tellers for 20% off your family discovery membership. In 1896, the U.S. Supreme Court ruled that segregation was legal, on a “separate but equal” basis. But for more than five decades, life for black and white Americans was seldom equal, but always separate. To fight segregation, the NAACP and others exposed the dismal and debasing conditions in black schools. They won a monumental victory in Brown v. Board of Education—but then a young boy from Chicago named Emmett Till was dredged from the swamps of Mississippi. Till’s death galvanized the movement. Listening to an activist speak about Till’s murder, one woman would rise to become the face of the fight against segregation. On a city bus in Montgomery, Alabama, Rosa Parks refused to give up her seat. President Abraham Lincoln issued the Emancipation Proclamation on January 1, 1863, freeing the slaves in much of the South. But the road to freedom—true freedom—would take generations longer for most black Americans. In this new six-part series, we investigate their struggle, beginning in the heady post-war years of the Forties. Segregation was endemic; it was the law of the South, and the custom of the North and West. No black American escaped its demeaning and often violent grip. But in discovering the power of collective protest, civil rights activists began to make demands for basic equality in restaurants, the workplace and in schools. And as they racked up victories, excitement and determination built that this was a movement with momentum. Could they really do this? Could they make a change and finally—finally—fight off Jim Crow? Sleep Number- Visit sleepnumber.com/tellers to find a store near you. Ancestry.com - Visit ancestry.com/tellers to get 20% off your ancestry DNA kit. In 1980, Jimmy Carter signed into law the The Alaska National Interest Lands Conservation Act, or ANILCA. That act remains controversial even today, as it set aside 43,585,000 acres of new national parklands in Alaska, including the Gates of the Arctic National Park and Preserve and the Yukon-Charley Rivers National Preserve. Superintendent Greg Dudgeon oversees both and continues to balance the mandate of the Parks’ mission with the needs of Alaskan residents. We’ll talk to Greg about his affection for the land, how Alaska captivated him early on, and the struggles of managing an area the size of Belgium, all entirely above the Arctic Circle. Alaska: big, open, frozen and wild. In 1867, the acquisition of Alaska from the Russian Empire was widely derided as “folly.” Early explorers like John Muir saw its potential though, and clamored for its preservation in the face of increasing development and calls for statehood. But when oil is discovered, the real fight begins. Caught between angry Alaskan individualists and an ambitious federal government, the National Park Service struggles to do what’s right for the land and the people who live and depend on it. Ancestry.com - Visit Ancestry.com/AHT to get 20% off your ancestry DNA kit. In 1914, America’s National Parks had a problem: no one was using them. And those few that were faced unmaintained roads, trails strewn with garbage, and a lack of amenities that made it hard for the average American to enjoy themselves. One man had enough, and went to Washington on a mission: establish a new National Parks Service, and transform these neglected, magic spaces into clean, approachable, fun vacation destinations. But in taking the reins, mining tycoon and marketing genius Stephen Mather would face many challenges: wolves, bears, fires, and his own internal torment. Quip - Visit GetQuip.com/TELLERS to get your first refill pack free with a toothbrush! In the early morning hours of Wednesday, April 18, 1906, the city of San Francisco was torn apart by a huge earthquake–but it was the subsequent fires that did the most damage. As the city sought to rebuild, it also sought a more secure water supply, to break the stranglehold of a water company monopoly and insure that if fire were to strike the city again, abundant water was available to fight it. But a new reservoir would require the flooding of a treasured portion of Yosemite, the Hetch Hetchy Valley, one of John Muir’s favorite locations. He and his new Sierra Club fiercely opposed the plan. But politicians in DC and San Francisco loved it. Played out across the nation, a conflict between preservationists like Muir and conservationists like Theodore Roosevelt would ultimately decide the fate of Hetch Hetchy. Put out to pasture, thinking his political career over, Theodore Roosevelt was atop a mountain when he heard the news: an assassin’s bullet would likely take President McKinley’s life, and make Roosevelt president. Upon his inauguration shortly after, Teddy brought his lifelong love of the natural world into the White House with him. He found his executive pen a powerful tool, setting aside vast swaths of land as preserves and monuments. And later, as he sought his first term as an elected president, he embarked on the most comprehensive tour of America’s natural wonders any president had ever made: he was struck speechless at the Grand Canyon, met naturalist John Burroughs in Yellowstone, and took “the most important camping trip in history” with John Muir in Yosemite. Yellowstone was our nation’s first national park. Its strange, wondrous landscapes were perfect for exploration - and exploitation. Upon Yellowstone’s discovery by white Americans, two races began: one to build a railroad to the park to capture its commercial potential, another to protect the land from desecration. One will fail, bringing down with it the nation’s economy. The other will require the US Army to succeed, but leave thousands of animals slaughtered and Native American tribes displaced. America's greatest National Parks are truly one of our country's greatest treasures. But many beautiful landmarks have ugly histories. Over the next few episodes, we’ll learn how good intentions sometimes lead to tragic and violent ends, and how in some instances, dirty business dealings would lead to the preservation of many of our countries greatest natural wonders. We've come to the end of our series on the American Revolution, but we can't say goodbye without saying hello to Russell Shorto. Russell adapted his book, Revolution Song, for this series on American History Tellers. If you were wondering why we chose these six people, what freedom meant for each of them, and why the fight we began then may still be something we're dealing with today, then this episode is for you! Stay tuned, we'll be back with our new series all about National Parks next week. The Revolution was fought for freedom, at least in name. Calls for freedom filled the air. No taxation without representation! Life, liberty and the pursuit of happiness! "I would never have drawn my sword in the cause of America if I could have conceived that thereby I was founding a land of slavery." This episode explores one man's experience of being a slave and then being free during America's founding decades. Quip - Visit GetQuip.com/TELLERS get your first refill pack free with a toothbrush! In 1788, the hot gossip in posh British circles was all about France and America. For their friends across the channel, the popular uprising against King Louis XVI seems to be heading toward Revolution. And for their unruly cousins across the Atlantic, the fledgling country seems already headed for ruin. But this is a country their people believed in - and not just white men. A new generation of American women, inspired by the Enlightenment, were calling for greater freedoms. Stitch Fix - Go to StitchFix.com/TELLERS to get started now. It’s 1786. For two years the city of Philadelphia has been celebrating its independence. For citizens of this brand new country, life is parties, meetings, debates and festivals - sometimes all blended together. But it wasn’t fun and games for everyone. Even before the war, American distrusted both the natives and the British. While Native American tribes weren’t a ‘side’ in the Revolutionary War, the politics and broken promises of the Colonies locked Indians, British and American forces alike in battle. Lightstream - Visit Lightstream.com/TELLERS for an additional discount. In 1776, the British Under Secretary of State for the American Colonies was giddy. The Americans needed to be punished like children for their bad behavior. “Roman severity,” he called it, and then when he crushed the rebellion, the American children could come crawling back to their British parents, begging for forgiveness. It would be his crowning glory, he thought. It was not. This Series of American History Tellers is written by Russell Shorto, author of the book Revolution Song. Get your copy of Revolution Song from W.W. Norton today. It’s 1754, and the British had developed thirteen colonies along the eastern seaboard of the American continent. You may be familiar with them. But what you may not know is that a skirmish between the British and French settlers, who colonized a strip of land lining the Mississippi River, is where a young George Washington made a serious war blunder that ultimately led to Revolution. Written by New York Times bestselling author, Russell Shorto, this is Revolution by American History Tellers. Over the next six episodes, we’ll dive into the Revolutionary War period from the perspectives of a slave, a woman, a native American, a common shoemaker and a British aristocrat. Policy Genius - Go to policygenius.com to compare top life insurers and policies. If you lived in an American city at the turn of the century, you got all of your news from a single source: the daily newspapers. No where was that more true than New York City; in the City, two papers ruled them all. You had the World and the Journal. And then men behind them were the most famous newsmen in American History. William Randolph Hearst headed up the Journal and Hungarian immigrant Joseph Pulitzer ran the World. In their mad scramble for readers, they’d pioneer daring technologies and set new precedents for aggressive investigative coverage. They poured millions of dollars into the fight even when their advisors warned it could push them over the brink. And in the end, it very nearly did. This is just the beginning of this story. You can listen to the rest on Business Wars. Support us by supporting our show! JFK said that nothing in the 1960s was "...more impressive to mankind, or more important for the long-range exploration of space..." than getting a man to the moon and back safely. As the Apollo 11 flight neared, the entire nation waited, enraptured. But back in the USSR, the Soviets were also making strides. Though the contest with the Soviets for technological superiority had always been a race, it was now a literal one - a U.S. manned spacecraft was about to chase down a Soviet robotic vessel. Hims - Act now before you start to notice hair loss! Visit ForHims.com/Tellers for a special offer! In times of crisis, Americans had always put their confidence in their country’s superiority in power, technology and leadership. America had never failed them. And in 1961, hope and faith in their country burned brighter than ever as NASA prepared to launch the first man into space. A month out from launch, that light was effectively snuffed. The Soviets beat them to it. On April 12, 1961, cosmonaut Yuri Alekseyevich Gagarin became the first person in space and the first person to orbit Earth. The world was in awe. And America was in shock. Bombas - Save 20% by visiting Bombas.com/TELLERS and enter code TELLERS at checkout. Sleep Number - Come into a sleep number store during their semi-annual sale and find a great deal on your new mattress. Find the location nearest you when you visit SleepNumber.com/Tellers. Policy Genius - Go to PolicyGenius.com for the easy way to compare and buy insurance. But for many Americans, the Eisenhower just wasn’t moving fast enough. Sputnik was still orbiting! The Soviets were winning! Eisenhower downplayed Sputnik,calling it “one small ball in the air,” but privately he was worried. The U.S. had the ability to beat the Soviets to space. But they didn’t. And Eisenhower wanted to know why. Warning: this episode is packed with as much explosive power as is packed in the warhead of a ballistic missile. ZipRecruiter - Post your job for free by going to ZipRecruiter.com/AHT. Squarespace - Get 10% off your domain when you use TELLERS at checkout at Squarespace.com. Travel Portland - visit TravelPortland.com to plan your trip to beautiful Portland, Oregon. Remember Werner von Braun? We talked a little bit about him in our Cold War series. He was in charge of the German rocket program in World War II. First used to lob missiles and bombs all over Europe, von Braun always dreamed of something better for his rockets. As the Soviet and American forces were closing in on Germany to end the war, von Braun saw only one way out: surrender to the American forces and get to the States. Amid the wreckage of the Third Reich, the first leg of the Space Race would be a sprint to locate von Braun. Quip - Starting at just $25 get a new modern toothbrush when you visit them at GetQuip.com/Tellers and get your first brush head refill for free! The phone in your hand is more powerful than all of the computers that put a man on the moon, combined. In the age of supercomputers, driverless cars, and mail-order DNA testing it’s easy to forget that the journey to these incredible innovations was a lot of surprising moments. We’re fascinated with the scientists, engineers and innovators who changed the world for the better… and sometimes worse. These are the leaps of mankind, as they happened. Introducing American Innovations from Wondery. Hosted by Steven Johnson, listen and subscribe to our first arc, The Dynamo of DNA, wherever you’re listening to this right now. Ring - Save $150 on a Ring of Security kit when you visit them at Ring.com/TELLERS. “Manifest Destiny” is a uniquely American idea. The phrase captured the sense of inevitability—and entitlement—many citizens still feel. But in the 19th century this idea consumed American’s thought and identity. In the minds of white settlers moving westward, expansion was key to protecting American democracy. But white settlers weren’t equipped for the wild, harsh, and desolate newly-American landscape they found. Those who did make it to California had Mexican governance to deal with - and they would deal with it however they saw fit to make California part of the United States. More war and bloodshed haunted the 1840s, and officially fulfilled Jackson’s autocratic legacy. 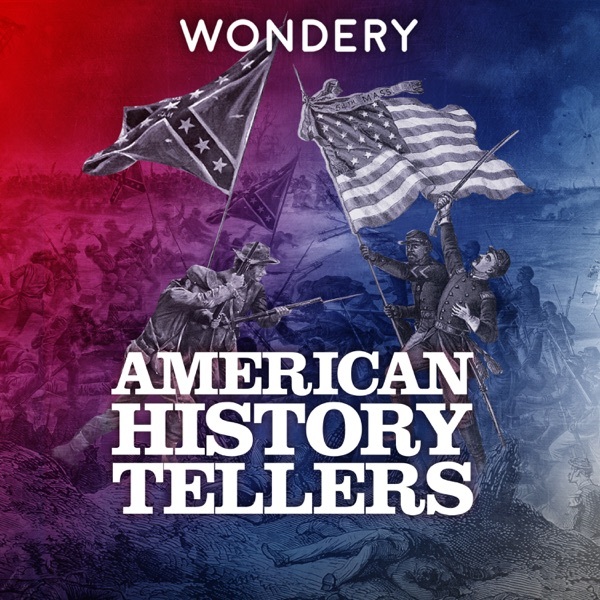 We hope you enjoyed this arc on American History Tellers. We’ll be back with a brand new series soon. During the last years of Jackson's presidency, the economy flourished. The national debt was paid in full, industry and agriculture boomed. But when Martin Van Buren assumed the presidency, he inherited an economic disaster. The divide between rich and poor was growing and people were starting to lose their patience. The country was so on edge that the threat of increase in the price of flour caused riots in Manhattan. How this happened and more, in today's episode. During his political rise, Jackson distinguished himself with his ability to exact ruthless military victories over indigenous people. As President Native Americans felt the brunt of this power. Whatever his achievements during his lifetime, his legacy is forever "Indian removal" from lands they'd originally inhabited to make way for white settlers. And none would feel the brunt of Jackson’s force more than the groups known as the Five Civilized Tribes—“civilized,” white settlers believed, because they raised animals and farmed. From the beginning, Jackson's administration was riddled with controversy. Citizens mobbed the White House on inauguration day, breaking furniture and fine china. They were only lured out with alcohol. And then there was the "Petticoat Affair." His Secretary of War, John Henry Eaton, was the ideal candidate for what we now call the Secretary of State, but there was one small problem... the most beautiful woman in Washington. John was having an affair with a sailor's wife which started rumors around town... that was nothing compared to the firestorm of gossip around town after he married her just after her husband's tragic death at sea. There was widespread chaos and controversy and Jackson's term was just getting started. In the summer of 1817, President James Monroe toured the country in an effort to unite the ever-growing United States, torn between bitter political battles that overshadowed national conflict. To Monroe, the nation seemed ready “to get back into the great family of the union.” And based on reactions to his speech, he was right. A Federalist newspaper hailed Monroe’s visit, and his message of togetherness, as a success. It ushered in what became known as “The Era of Good Feelings.” In truth, it was barely an era at all. The appearance of political unity had already begun to crack in 1819, when the Monroe administration faced its first serious political crisis: the Missouri Controversy. In August 1814, the White House burned. A fire that would eventually consume the entire nation in Civil War was already burning. This is Antebellum America. This is the adolescence of the United States, when the country grew at tremendous speed, and when fundamental questions about the kind of place it would be were being asked. Like, could the states put their individual differences aside to remain one country? And could this new country live up to its lofty ideals, especially when it came to issues like slavery or the treatment of Native Americans? Welcome to the Age of Jackson. Do you know the record for the longest ratification period of any constitutional amendment? Lillian Cunningham did. She’s an editor with the Washington Post, host of two outstanding American History podcasts, Presidential and Constitutional, and she’s our guest today. We’ll talk about amendments, those presidents you can never remember (can you name anything about Millard Fillmore?) and she helps us preview the next series on AHT, the Age of Jackson. Audible - Get a 30-day trial and a free audio book when you visit them at Audible.com/Tellers or text TELLERS to 500500. HelloFresh - To get $30 off your first week, use code TELLERS30 at hellofresh.com. The people had spoken: They wanted beer, and they wanted it now, but not just for drinking. Protestors wanted the jobs that came with breweries, and the country was desperate from the money that could come from alcohol taxes. As quickly as temperance organizations sprang up in the decade before, anti-Prohibition organizations appeared in every city. But, a constitutional amendment had never been repealed before. The anti-Prohibition leagues realized they needed someone bigger than a governor or mayor to repeal this. They went after the Presidency. For a deeper understanding of the interplay between beer, taxation and the history of Repeal, Ambitious Brew: The Story of American Brew by Maureen Ogle is essential reading. Kenneth D. Rose’s American Women and the Repeal of Prohibition provided insight into Pauline Sabin’s work, as did David J. Hanson’s comprehensive resource, Alcohol Problems and Solutions. Those who want to do a deeper dive into the 1932 DNC and the mob’s involvement, you can read more in the article from Salon, Corruption for Decades. Lisa McGirr’s The War on Alcohol: Prohibition and the Rise of the American State also explores the relationship between the New Deal and Repeal. For more on Cox’s Army, check out The Bonus Army: An American Epic by Paul Dixon and Thomas B. Allen. Andrew Barr’s Drink: A Social History of America contains a great chapter about the failure of controls and the legacy of prohibition in state liquor laws and the relationship between California’s wine industry and repeal is well documented in When the Rivers Ran Red by Vivienne Sosnowski. To catch up with the bartenders who are bringing back pre-Prohibition cocktails, David Wondrich’s Imbibe is required reading. Closing Time by Daniel Francis provides a good account of the border wars and smuggling across the northern border. Robert Rockaway’s article “The Notorious Purple Gang” details the gang’s origin as well as the Cleaners and Dyers War. For information about the link between Prohibition and organized crime in Chicago, Gus Russo’s The Outfit and Get Capone by Johnathan Eig are invaluable sources. Al Capone’s Beer Wars by John J. Binder is a fantastic re-assessment of the period that sorts out some of the fact from fiction, in a highly mythologized period. For more on the Increased Penalties Act, Michael Lerner’s Dry Manhattan, is a good resource used for this podcast, as is Daniel Okrent’s Last Call. Robin Room’s The Movies and the Wettening of America is the source for the section on Hollywood’s move away from temperance. Kenneth D. Rose’s American Women and the Repeal of Prohibition provided insight into Pauline Sabin’s work, as did David J. Hanson’s comprehensive resource, Alcohol Problems and Solutions. The Washington Post’s recap of The Man in the Green Hat exposé is available here. The rise of the speakeasy was one of many unintended consequences of Prohibition - and others were much deadlier. Not coincidentally, at the same time Prohibition was taking effect, the Klu Klux Klan rose to power. They combined Prohibition’s anti-immigrant rhetoric with violence. As the number of speakeasies continued to grow, and states continued to buckle down, suppliers couldn’t keep up. Quality went down. Most bootleg alcohol from the time had elements of stuff that would kill you. But people everywhere still wanted to drink - and they would go to any length to get one. Almost everyone could see there was a problem with how Prohibition was actually playing out, but no one could agree what the solution was. No Place of Grace by T. J. Jackson Lears is a fantastic book to learn about the roots of modernism and anti-modernism in American culture. Allan Levine’s The Devil in Babylon also explores these themes, specifically how these impulses played out in 1920’s America. For more on the author of Elmer Gantry, Sinclair Lewis: Rebel from Main Street by Richard Lingerman is a great read. And to understand the relationship between the Ku Klux Klan and Prohibition, Paul Angle’s Bloody Williamson: A Chapter in American Lawlessness and Thomas Pegram’s articles and books, including One Hundred Percent American are essential reading. Again, Lisa McGirr’s The War on Alcohol explores these topics quite thoroughly and connects them to the rise of the modern state. A few different articles have delved into the dirty political campaigns of the 1920s, including this good summary by Mental Floss. When a German U-boat torpedoed the RMS Lusitania on Friday, May 7th, 1915, Americans found two new enemies: Germany and the beer it was so associated with. Anti-German sentiment grew, and with it hostility to the breweries founded in the 19th century by German immigrants. Soon, the war effort and the temperance movement were linked: it was patriotic to abstain, and Prohibition became law. How did America cope? They swapped their stool at the bar for a seat at the soda shop, listening to new radios and the first ever baseball broadcasts. But Americans’ thirst wasn’t ever fully quenched: they turned to family doctors who prescribed “medicinal alcohol,” and then finally to the bootleggers, moonshiners and rum-runners who made, smuggled and sold hooch of all types, from top-shelf French cognac to homemade swill that might just kill you. For more about the Lusitania, check out Dead Wake: The Crossing of the Lusitania by Erik Larson. Daniel Okrent’s Last Call: The Rise and Fall of Prohibition has more information on medicinal alcohol and how it was prescribed by doctors. To learn more about medicinal beer, this article by Beverly Gage for The Smithsonian is excellent. The 1991 study “Alcohol Consumption During Prohibition” by Jeffrey A. Miron and Jeffrey Zwiebel, is considered the definitive study about how much people actually drank during the noble experiment. For more information on how Prohibition played out in the early days, check out Professor David J. Hanson’s, “Alcohol Problems and Solutions,” a comprehensive, interactive site that outlines all the various stakeholders in the Noble Experiment. To read more about Americans behaving badly in Cuba and other places during Prohibition, check out Wayne Curtis’s And A Bootle of Rum: A History of the World in Ten Cocktails, as well as Matthew Rowley’s Lost Recipes of Prohibition. And, to learn more about rum-runners, Daniel Francis’s book, Closing Time: Prohibition, Rum-Runners and Border Wars is an excellent reference.